Millions of Iranians took part in the annual "Death to Israel Day" in Iran on Friday, ironically coinciding with the twice-extended deadline for a deal on the Islamic regime's nuclear program that apparently will be extended yet again. Iranian Foreign Minister Mohammad Javad Zarif on Friday confirmed US Secretary of State John Kerry's statements the day before, when Kerry said the talks "wont be rushed." Speaking to the state-run PressTV, Zarif said that he "doubts it" that a deal will be made by Friday, saying that in the nuclear talks "we're making progress. It seems we are staying here for the weekend. We're working. We're not there yet." Meanwhile tens of thousands of Iranians took to the streets of Tehran chanting "down with America" and "death to Israel," reports the Associated Press citing local media. In Tehran, several protesters burned Israeli and American flags as is custom on Quds Day or Jerusalem Day as it is officially known. Saudi Arabia was also targeted in the protests, as the Sunni states squares off against the Houthi proxy of Shi'ite Iran in Yemen. 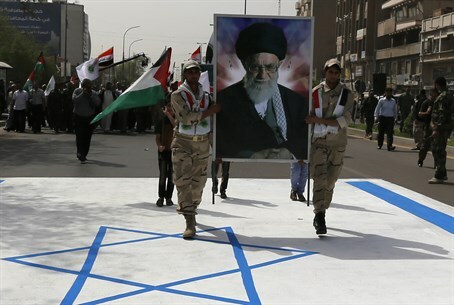 According to PressTV, the rallies calling for the destruction of Israel are taking place in Tehran "and in over 770 towns and cities across the country." Iranian Fars News Agency reports that millions of Iranians are taking part in the protests around the country. Iranian President Hassan Rouhani also took part in the day's events, but AFP reports that he did not address the crowd, possibly out of awareness of the sensitive timing with the nuclear talks. However, on Wednesday he told Fars that the day was an opportunity for Iran to “shout its hatred” of Israel. Quds Day is held annually on the final Friday of the Muslim fast month of Ramadan. It was instituted on August 7, 1979 by then-Iranian Supreme Leader Ayatollah Ruhollah Khomeini just after the Islamic Revolution, as a day of solidarity against the "usurper Israel." The protest is held in Iran and around the world - this year the Quds Day rallies are to be held in 19 cities throughout North America, including a rally in New York City's iconic Times Square. Regarding the nuclear talks, Kerry admitted on Thursday that "tough issues remain," adding "we shouldn’t get up to leave because the clock strikes midnight." Congress will have 60 days to review any deal that is reached, during which time the US government will be unable to lift sanctions on Iran; the Islamic regime has demanded an immediate lifting of all sanctions as soon as a deal is signed. Aside from the sanctions issue, other major disagreements in the talks have included Iran's refusal to allow inspections on sensitive nuclear sites, its refusal to disclose the military aspects of its nuclear program, and in a newly added demand, Iran has called to end the UN arms embargo on the Islamic regime.